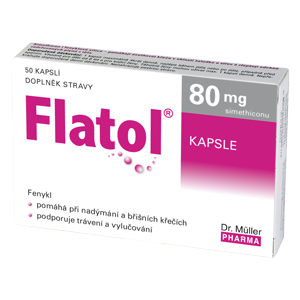 Flatol® capsules contain simethicone and fennel oil. The capsules with 80 mg of simethicone and fennel oil are convenient for relief from flatulence and bloating, sensation of excessively full stomach, and from noisy bowel movement. 1 capsule maximum 4 times daily, best during or after meals and/or before going to bed. The product is intended only for short-term use in case of an increased formation of flatuses. Do not exceed the recommended doses. The product does not substitute varied diet. Not intended for children, teenagers, pregnant and breast-feeding women. Keep out of the sight and reach of children.